Description: Adiantum raddianum grows up to 45 cm tall with a spread of up to 60 cm. 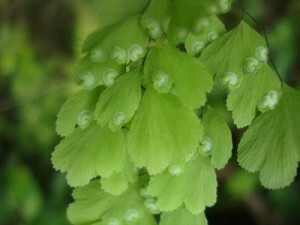 The triangular, dark green fronds may be 20 cm long and 15 cm at their widest point and are divided into numerous delicate, wedge-shaped leaflets. There are many forms of Adiantum raddianum, all slightly different in scale, colour and general shape. The fronds of all Adiantum raddianum forms, however, are semi-erect at fist drooping gracefully as they mature.